Image size: 30"w x 24"h.
Summer has come to Phillips Bay. Along Apple Creek, nestled among the Cotswold Hills about 30 minutes west of Phillips Bay, the sounds of meadowlarks and bullfrogs mingle with the aroma of flowers and fresh-cut grass. Apple Creek Valley maintains much of its original colonial charm. One can sit on the lawn at the Apple Creek Inn for a picnic in the sun’s warm glow, or enjoy the creek itself, with its clear spring water, swimming hole and slow current, well suited to the many idyllic pursuits of summer. 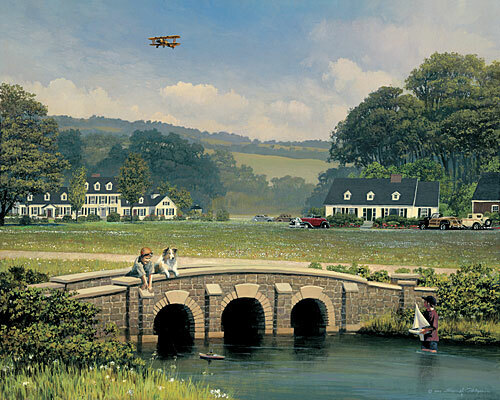 On this day, a pair of boys and their dog have gathered at the old stone footbridge for a little boating. Tying their boats to string with a metal fishing sinker as a counterweight, they set their imaginations afloat. These boys will build a rich treasury of memories over the years as members of the Apple Creek Yacht Club.